The other night, I watched (most of) the documentary Out of the Shadow. 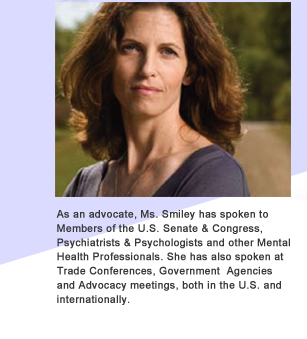 Written and produced by Susan Smiley, the doc features Smiley’s mother, Millie, an intelligent, likeable woman diagnosed with paranoid schizophrenia. You are not alone. Come out of the shadows. Fight the shame and stigma. This is an honest, moving, profound film about mental illness, and a family who copes. Here you will find hope, compassion and inspiration. Even with today’s focus on support groups and sharing information, in our “Free to Be You and Me” society there is still a lot of shame and confusion around mental illness. Many are driven to hiding their condition and some to suicide. Out of the Shadow ends on a positive note for Millie but it does not paint a pretty picture of children, adults and families living with schizophrenia. The various doctors Millie saw, the drug combinations she contended with, and the vast economic difficulties and social stigma she felt left me feeling raw and drained. It’s not for the faint of heart but it is a riveting and important film. If you’d like to learn more, you can watch a film trailer on the site or order a DVD online. This entry was posted in Experts, Facts, Philosophy, Social and tagged A Hard Name, about, adults, documentary, feelings, mental health, psychologist, trauma. Bookmark the permalink. Lisa, I think your blog is a very important and needed tool for the public. Great job. I want to watch this documentary. Early in my career, I was a case manager at a mental health agency. The whole situation was heartbreaking. The symptoms, the medication that doesn’t help or has side-effects and the stigma is a lot for a person to handle. Thanks for sharing this. @ Jan – thank you so much for saying that. @ Peg – it’s a great documentary; not at all slick or contrived or easy to swallow though.